There’s something magical about the internet. When it all started for the public, back in 1996, we might not have realized it fully. But now it’s very clear: humankind is connected like never before. What we photograph, film or write can be shared instantly, all over the globe. No friends or acquaintances have to disappear from memory. For good or bad, information and communication have never been so accessible to so many people at the same time. Still, as the controversy around Facebook and Cambridge Analytics have shown, we should ever be vigilant. The big corporations work in mysterious ways. Unless forced by law they tend to keep their cards to their chest. Understandably. If I were a big multinational with vested interests all over the world, I would too. But I’m not. I’m part of a small outfit who decided to pick up the ball where Google dropped it. This is the true story of internet startpages. 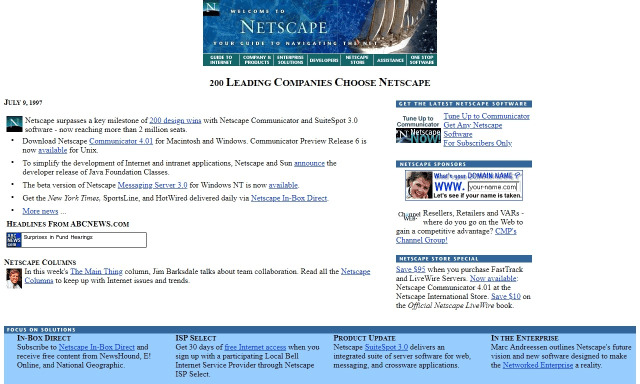 The homepage of Netscape, back in the day, brings back feelings of nostalgia. We couldn’t begin telling this story without Netscape Navigator, back in 1994. One of the very first browsers to capture the imagination of the public. Co-written by Marc Andreessen, and based on the Mosaic browser, it ushered in the beginning of the user-friendly connection of computers all over the world. While the first version was free, eventually Netscape Navigator was only free for university and non-profit use. It offered technological innovations such as the ‘on-the-fly’ display of web pages, even when they were still downloading in the background. For slower dial-up connections this was a real plus. The de-facto standard in the late 1990’s, I like to see Netscape Navigator also as a fine example of the first startpage paradigm. Netscape gave people the opportunity to connect to the internet by a telephone line (don’t you miss the annoying buzzing sound?). And while it at first limited their startpage to company news, it later on also provided a bit of news, opinions, and advertising, right there on the page. 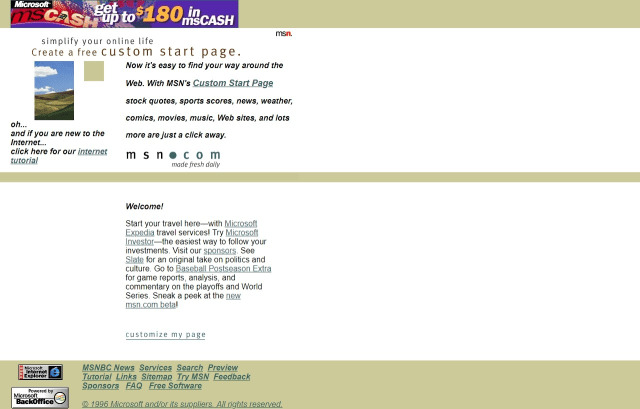 Especially after AOL bought the company, back in 1998, we see this part of the browsing experience come to full fruition. With a market share of over 50% and some signs of monopolistic behavior, Netscape Navigator considered the future of computing to be theirs. Their browser operated on just about every operating system. It looked identical on nearly all of them. And what if all programs could be run from within the browser window itself? At its public IPO, back in August 1995, it’s value had skyrocketed to nearly 3 billion USD. Netscape was the de-facto portal to the web. But the same year, 1995, also saw the release of Microsoft’s new version of the operating system, Windows 95, with the free browser Internet Explorer. This browser was built on the same Mosaic platform as Navigator, and not really competitive. But it was free, and it got improved, until, in 1996, with the release of version 3.0 it had fully caught up with Netscape. And as the development of Explorer continued while Netscape faltered, market share slowly but surely went over to Microsoft. There are many other reasons for the demise of Navigator, but the result was undeniable: by 2002 Internet Explorer was leading the pack with a market share of over 95%. And what did you see when you opened the program? The homepage of MSN.com. With a general section of bookmarks, news, and advertisements. There is also the opportunity to sign in and ‘Customize your own page with local news, weather, and more!’ It really didn’t look very much different from the startpage you’d get on Netscape Navigator. But it was free, stable and modern. Sometimes that’s enough to win a war. 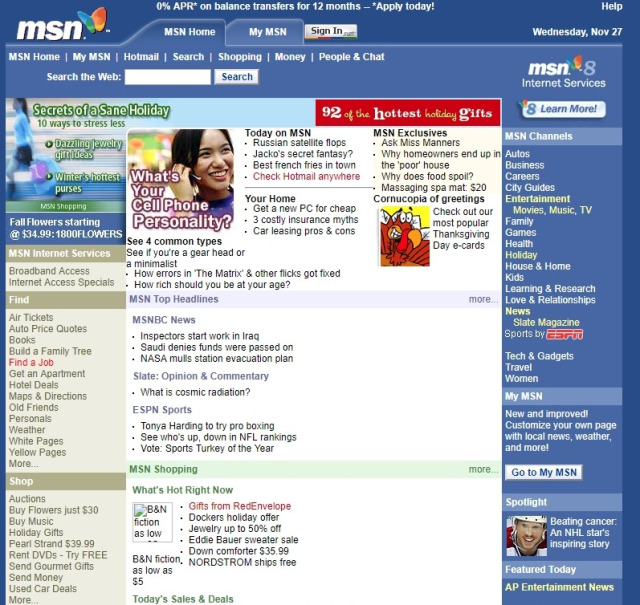 A snapshot of the MSN homepage, November 2002. With package deals and a superior product, Microsoft managed to dominate the market for Internet Browsers. But it also raised questions about an abuse of resources and monopolistic behavior, so much so, that it found itself in court. For the customer, this didn’t change anything. Just as before, with Netscape Navigator, the technological advancements of Internet Explorer came to a halt once they achieved their position. This meant: security issues. Slower browsing as the technical demands became more complex. It had to take another giant in the world of technology to battle Microsoft and uproot the status quo. This giant was Google, of course. 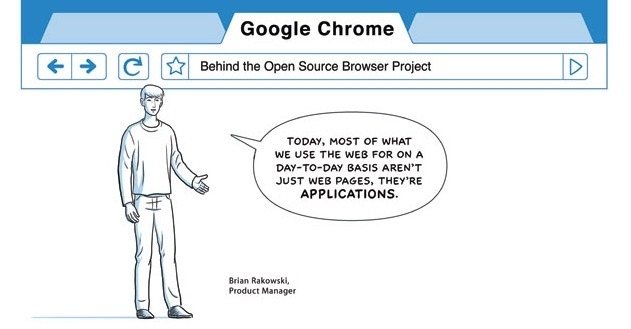 A comic by Scott McCloud, explaining the features of the new browser. 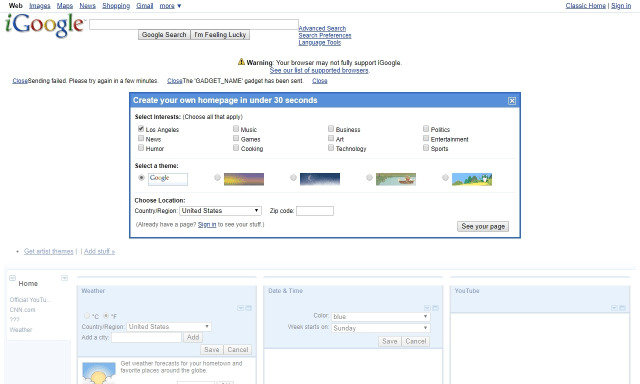 What Google started in 2008, was nothing less than a second browser war. Based on part of the technology of Netscape, the Mozilla project was a brand new Open Source project. It was developed for the many new applications the Internet would come to thrive upon, such as chat programs, youtube videos, e-mail programs. It aimed to be fast (hence: chrome, as used on fast motorcycles), designed for new applications and safe. Eventually, Google built a whole suite of programs and products around their browser, including Chromecast and Chromebooks. The user experience is simple: a few menus and little visual clutter. Just the way they became big with their central search box. Initially, they didn’t want to make a lot of money with their new browser. They just wanted people to use their product. Their revenue from their search engine, just like Microsofts from their Operating System, was enough to keep this pressure off the development team. It took Google until 2012 to overtake Internet Explorer in terms of market share, and it’s been dominant ever since. And as their engine runs on all platforms, we see their dominance on desktops, mobile phones, and tablets alike. Quite an achievement. But at what cost? You can’t really take offense with the Google company when it comes to winning the second browser wars. Their project has simply been chosen by the public. It’s fast, convenient, free. And back in 2008, when you had the choice of at least ten different browsers, if you wanted to install a copy of Windows, it wasn’t Mozilla Firefox or Safari who proved to be the chosen. Let alone Explorer. It was Chrome. Now their market share hovers around 56%, quite respectable. Come to think of it, there’s only one loser in this situation. It’s the customizable homepage. As soon as Google gained the upper hand, they discontinued the service they called iGoogle, that they launched together with their new browser in 2008. This is a more than remarkable business decision. It’s proof that the startpage you could change and adapt to meet your own needs, the thing that was really a big thing in the days of MSN and AOL, is less interesting to them than their own white search box. They prefer you to search for the weather time and time again, rather than see it right there on the page. It makes perfect sense. This might just be the reason they also discontinued Google Reader, useful as it was for any researcher. Whenever a service threatens the search, it should go. Search the web and nothing more than that! With the end of the browser wars, the single search box has definitely, perhaps even definitively, won. Simplicity over information. Minimalism over freedom of choice. This is the clean world Google has created for their customers, a world where most algorithms and search results are concocted under the hood. Far away from prying eyes. They took away the personalizes startpages, so we’re ever more at the mercy of their business model. There are risks involved, let’s not forget this: the risk of filter bubbles and loss of productivity through retyping in search of the same information. We could be coaxed in ways we can’t really tell. Manipulated to buy, for example. To vote this or that way. We put a lot of trust in a company that can follow us on every device we use every day. There’s nothing wrong with that, as long as we’re aware of the fact that we are trusting them. And also, with the advances in technology, like HTML5, it’s easier than ever to install our own homepage, in order to avoid the monolithic search box. We could even install third party, personalized startpages like start.me, Symbaloo or Netvibes in order to regain our startpage freedom. We really think Google would approve.